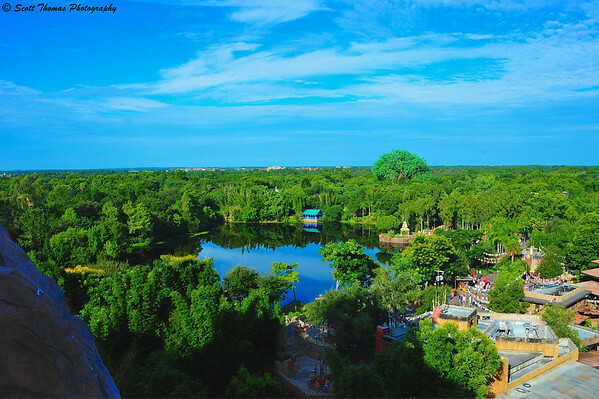 The view of Disney's Animal Kingdom from Expedition Everest thrill ride in Walt Disney World. Nikon D700/28-300VR, 1/250s, f/16, ISO 450, EV -0.3, 28mm focal length. Things are getting a bit ragged around here lately. I will be on vacation for the next week. No, not Walt Disney World this time. I will have Internet access so look for some updates over the next week. Watch the Twitter feed (see Follow Me on Twitter in the left sidebar) for comments and photos of my latest adventures. If you are on Twitter, I invite you to follow me. This entry was posted in Travel, Weekly View and tagged 28-300mm, coaster, disney's animal kingdom, expedition everest, high, landscape, nikon D700, Photography, reflection, ride, thrill, vr, walt disney world, water. Bookmark the permalink. Have a good and safe trip, Scott! Thanks, Terry. Made it to North Dakota without incident. Yep, this was the upward climb which is not very fast but very, very high. That’s an amazing shot, love the blue sky. Have a nice vacation and looking forward to seeing more photos. Thankfully Walt Disney World has something for everyone. Especially for us photographers. You Disney folks are making me yearn to go back. Maybe I can bend all of your “ears” one of these days about the best time for someone who works in a school to go. School vacations are nightmares of course, and one-week vacations during the school year are just not an option. So how do you choose a spot like North Dakota for a vacation? How soon we forget. Remember my trip out here in January? My daughter works out here. Florida is so much green and blue! Tune in tomorrow to find out, Carsten!